Easy and Delicious Caramelized Cabbage and Onions are a rich, buttery and insanely addictive Easy Caramelized Cabbage and Onions recipe! The best pan fried cabbage ever with simple ingredients that anyone can make! This recipe originally appeared on Sweet C’s in 2011 as one of the first recipes I ever shared – and has continued to be one of my favorite easy side dishes ever since! Of all of the countries I have visited, there is one that calls me more and more every time I think of it – my family’s homeland, Ireland is at the top of my favorite countries to visit. Ireland is gorgeous, calm, steeped in tradition and incredible history – and despite the stereotype of terribly bland food, Irish cuisine is actually bursting with flavor and full of fresh, beautiful ingredients. I swear, everything in Ireland just tastes better – it has to be all the rain and green! One of my favorite things to order when in Ireland is always cabbage. It’s everywhere, it’s fresh, it goes well with almost anything – and it is sooooo delicious. 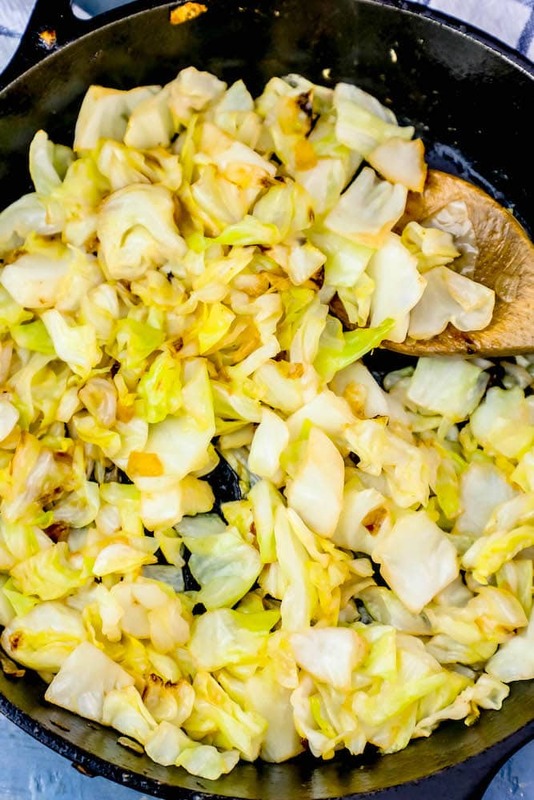 I used to avoid cabbage, but have really come to love it, especially when it is pan-fried and caramelized to bring out the buttery rich and slightly sweet cabbage flavor that comes from letting it wilt and brown so the sugars can break down and caramelize. Just Take Me To The Best Caramelized Cabbage and Onions Recipe Already! If you’d like to skip my helpful tips and tricks and additional recipe ideas, please scroll to the bottom of the page where you will find the easy printable caramelized cabbage and onions recipe. I get a lot of questions and requests for similar recipes on my posts, so I try to provide as much information as possible. If you’d rather skip it, please scroll to the end! When you think of Irish dishes to celebrate St. Patricks Day, does anything pop in to your mind before Corned Beef and Cabbage? Funny enough, the tradition of serving corned beef and cabbage for Saint Patricks Day is actually an American creation – adopted by Irish Immigrants to America (like my family) who wanted a taste of the homeland to celebrate the Emerald Isle’s patron saint. Regardless of how corned beef and cabbage became synonymous with Ireland and the celebration of Saint Patrick, it is one of my favorite meals every year! 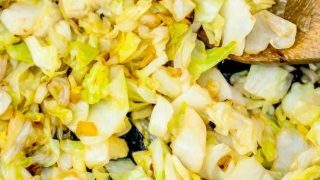 I always think of eating salty, delicious roasted beef paired with buttery, delicious cabbage when I start thinking all things green… but I know a lot of people aren’t huge fans of cabbage, because it can be so bitter. …and many other Irish main dishes to make a fun and festive Saint Patricks Day feast! 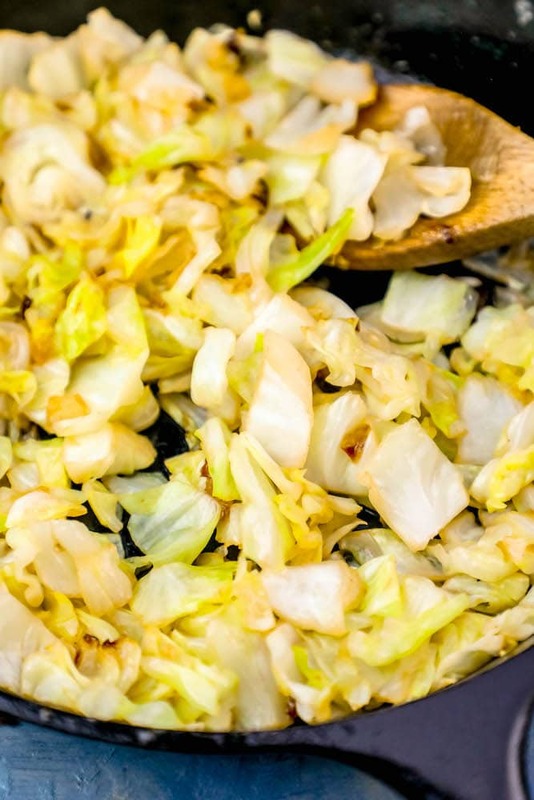 Not only is the best pan fried cabbage super easy to make, but this side dish is PACKED with tons of nutrients – making it a delicious way to celebrate Irish food that won’t break your keto diet, paleo diet, low carb diet, Weight Watchers diet – and other healthy eating plans! Cabbage is extremely good for you, and something I try to incorporate more into our diets. I really love the rich and buttery flavor of cabbage when it’s cooked – and it is a great vegetable to get kids into, since when cooked it has a subtle flavor kids love. 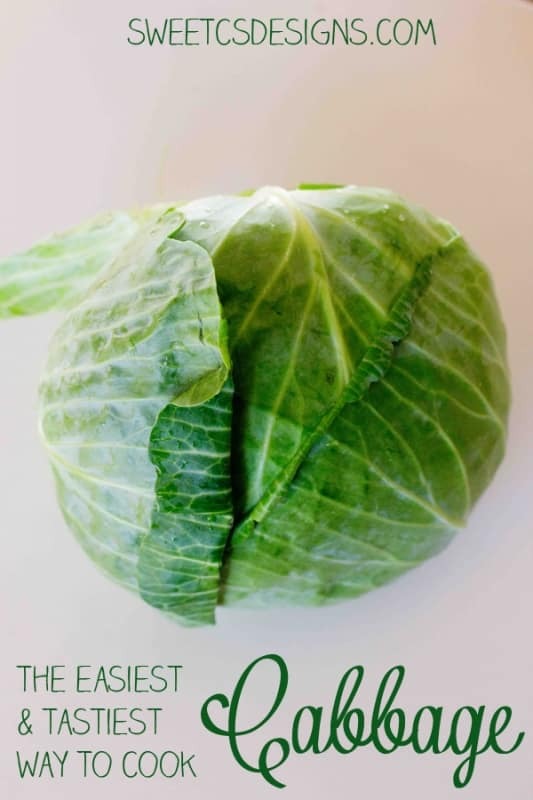 This keto cabbage recipe is low carb – and really filling – making it a good choice for those on carb-restricted diets. Cabbage ranks right up with broccoli, cauliflower, and brussels sprouts with a reputation for fighting cancer – and it also helps prevent or cure canker sores. Cruciferous vegetables are packed with Vitamin C, Fiber, Potassium, and other essential nutrients. Cabbage is also awesome for people on a diet – the high fiber and low carbohydrate levels keep you full without crashing, and cabbage is great for keto diets and low carb diets, too! If you’re watching fat and calories, and worried about adding butter, this recipe works great with a heart-healthy, Omega 3 packed oil as well – so it can work in any diet or healthy eating plan! Of course, I love the rich butter flavor – and opt for Irish butter from grass-fed cows. To kick this recipe up with a meaty, salty bacon flavor everyone loves, skip the butter and instead fry 2-3 pieces of bacon in the pan, removing when they are crispy. Fry cabbage and onions in bacon fat instead of butter, and top with crumbled bacon bits when done. If you’re looking for a set it and forget it recipe for caramelized cabbage and onions, you can add the ingredients in a glass casserole dish and bake at 350 until golden brown. Be sure to stir often, checking the cabbage after 30 minutes to prevent burning or sticking to the dish, and help it cook evenly. 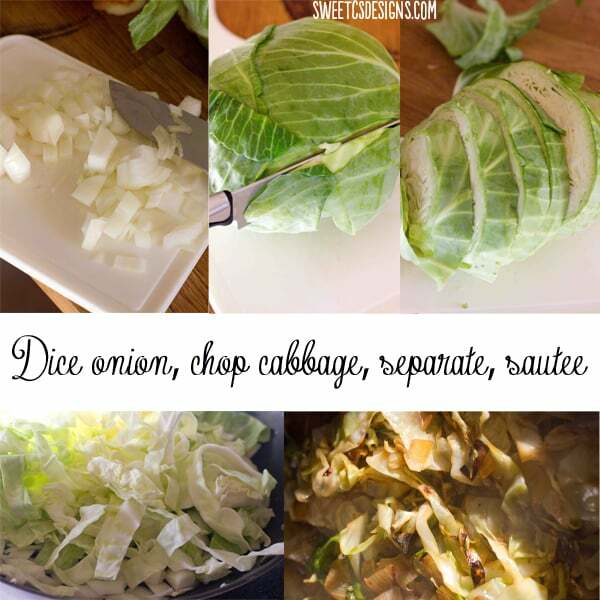 Depending on the size of your cabbage, how thickly you slice it, and your oven, this will take anywhere between 40 minutes to an hour to get lovely, buttery, wilted and caramelized cabbage and onions. When your cabbage and onions have started to reduce in the pan (about 5-10 minutes after cooking on medium high), add 1/2 cup Irish whiskey to the pan (making sure to scrape up any browned bits from the bottom of the pan), and bring to a rapid boil. Carefully light whiskey on fire (use a long match to be safe), and let Whiskey burn down and turn into a rich, sweet, and smoky glaze for your fried cabbage and onions! 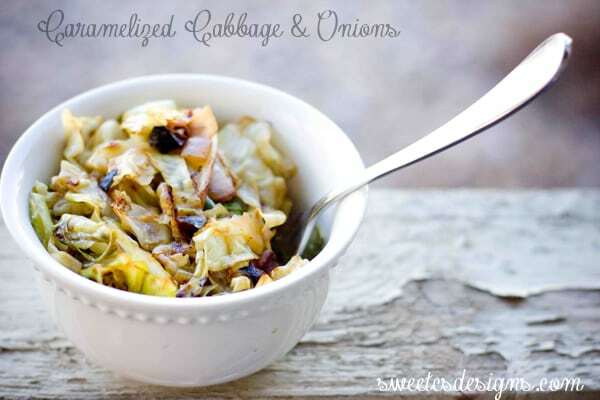 If you love this Easy Delicious Caramelized Cabbage and Onions Recipe as much as I do, please write a five star review in the comment section below (or on Pinterest with the “tried it” button – you can now add pictures into reviews, too! ), and be sure to help me share on facebook! If you’d like to see me make this recipe, please click to see the video below! Perfect Saint Patrick's Day side dish - Easy and Delicious Caramelized Cabbage and Onions are a rich, buttery and insanely addictive Irish cabbage recipe! 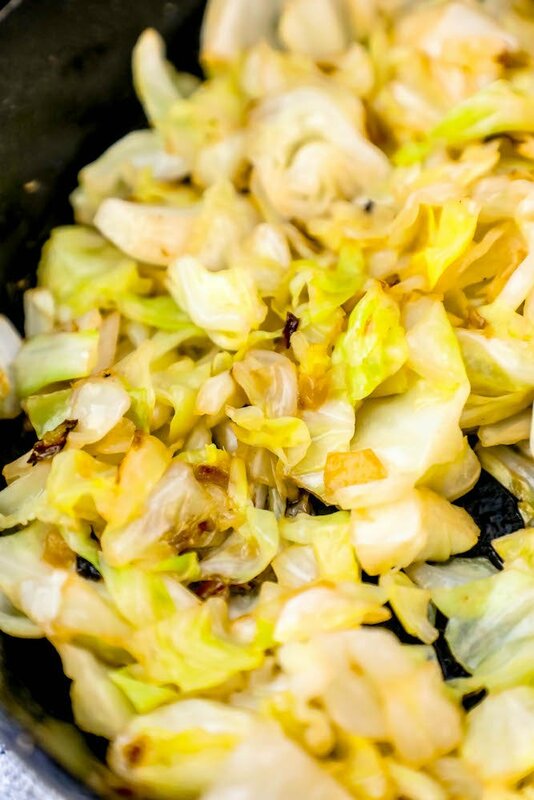 The best pan fried cabbage ever with simple ingredients that anyone can make! Heat butter in large pan on medium-high heat until melted and foamy. Add diced onions to pan, cook until soft and transparent, about 4 minutes. Stir to prevent sticking or burning. Add garlic to pan, cook until fragrant and soft, about 3 minutes. Add cabbage to pan and toss well to coat in butter. Let cabbage reduce by half, about 10 minutes, stirring occasionally as it cooks down to prevent burning and allow it to cook evenly. When cabbage has lost much of it's volume and started to turn shiny, slightly translucent, and has lovely browned bits, it is ready to serve. Remove from heat and plate with your favorite meat, casserole, fish, or other main dish! What are you doing for St. Pats this year? If you’re in need of some fun decor check out my absolute favorite Irish Blessing that I made into a free chalkboard-style printable, here! I’m trying this tonight, substituting duck fat for bacon. Thanks for the recipe! Turned out perfect! So good!! Too much garlic. Otherwise very good! ? Looks delicious and very appropriate for my diet. Will try it today. Thanks for sharing!! ?? The nutrition information looks like its WAY OFF! I use a program that calculates for me – and oddly, doesn’t always show me what it calculates until I publish a post. I had to refresh it again and it worked – technology gets the best of us sometimes! Thanks for letting me know so I could check it. De – I am not a nutritionist and use a widget on my site that calculates nutrition for me automatically. It’s close, but when counting macros, I would always double check yourself… I think 18 is a little off base for this as well. In the deep south we use bacon drippings instead of butter or oil y’all. I’ve done it with olive oil a lot. The butter does give it a richness you don’t get with oil- but if you have a little vegeta (or even vegemite) on hand, you could add a little. Even a bit of veggie stock. Just gives it a little extra flavor! Okay, so dinner was served and it was so good! Even my kids ate it!!!! Looks great! How many would you say this serves? I love cabbage so this sounds very yummy to me. I must try it! Thanks for sharing.